Photography and fishing guide services provided by Jarred Nellis of Door County on the Fly, doorcountyonthefly.com. Alicia Wang lost track of how many references to the “Golden Ticket” she heard when telling the story of recently catching a banded walleye in the Sturgeon Bay canal. The walleye came with an orange band imbedded in it that says the lucky angler can claim a reward for catching the fish. It’s not exactly a trip to the Willy Wonka Chocolate Factory, but it is 100 bucks. Wang, a recent Door County transplant, was fishing May 25 with Egg Harbor Village Administrator Ryan Heise, an avid angler, aboard a vessel captained by Jared Nellis, who started a new fishing charter service he calls Door County on the Fly (doorcountyonthefly.com). According to Daniel Isermann of the United States Geological Survey, Wisconsin Cooperative Fishery Research Unit based at the University of Wisconsin-Stevens Point, Wang caught one of 300 walleye that he and other researchers released into Green Bay last fall with transmitters inserted into their body cavities. The transmitters, which are supposed to last for four years, send out a coded signal picked up by 150 acoustic receivers that were deployed throughout the area. The hope is that the data provides important details of the seasonal movement of walleye and whitefish in Green Bay (transmitters were also implanted in 400 whitefish). To date, Isermann said 35 of the transmitting walleye and seven whitefish have been recovered by anglers. “Some of these have been released and the angler snipped off the orange tag, which does get $100,” he said. 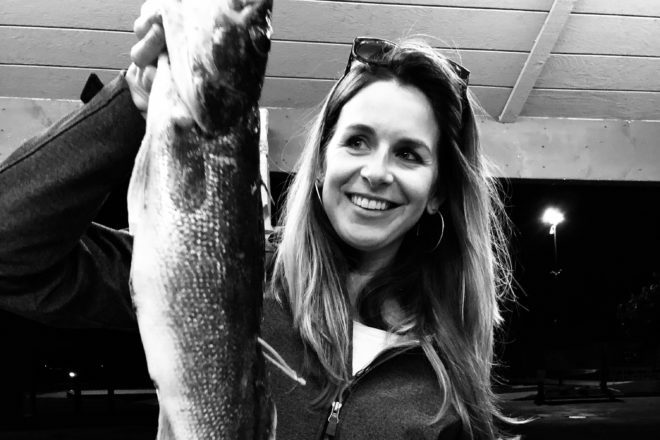 Since she caught the fish Friday evening and did not plan to contact the phone number on the band until after the long Memorial Day weekend, Wang placed the walleye in the freezer, which caused some concern later when she learned the caught fish should not be frozen before turning it over to researchers. But Isermann said she will still get her $100 for catching the fish. While the several-day stay in the freezer might have affected the implanted device’s temperature logger, he said the transmitter should be fine. A recovered transmitter can be implanted in another fish to continue tracking efforts. If you catch one of these tagged fish, do not freeze the fish and call 715.346.2178 or email [email protected] to coordinate the tag’s return and reward.